CAR 54, Where Are You? is considered one of the best television comedies ever produced. From 1961 to 1963, Officers Toody and Muldoon were among the most unlikely patrol-car partners ever seen on a police force. Toody was short, stocky, and just a it nosy, a marked contrast to the tall, quiet Muldoon. 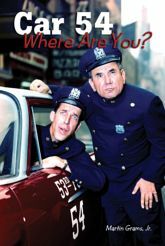 Although they were assigned to New York's fictional 53rd precinct -- a run down area of the Bronx not generally considered a hotbead of hilarity -- they always seemed to encounter more comedy than crime. From the episode "Something Nice for Sol" to the classic Christmas episode of 1961, this light-hearted comedy offered a heart-warming approach to our police force at work. The comedy was invariably of the broad slapstick variety reminiscent of Mack Sennett -- and one episode even soluted the Keystone Cops! Created by Nat Hiken, this television program now receives a superb review including biographies on the lead actors, the creation of the series, detailed listings of all 60 television episodes, broadcast history, cast list, plot summaries and lots of behind-the-scenes stories.